West Seattle is a hilly district west of downtown Seattle and the Duwamish River. This desirable area with its memorable views of the Seattle skyline, Puget Sound and the Olympic and Cascade mountains is made up of several neighborhoods, large parks and a beachfront. The community hosts several popular natural settings, including Alki Beach, Lincoln Park, Longfellow Creek and Trail, Schmitz Preserve Park and Westcrest Park. A shuttle ferry, the West Seattle Water Taxi, makes runs to downtown Seattle while Washington State Ferries in the Fauntleroy neighborhood serve nearby Vashon Island and Southworth on the Kitsap Peninsula. 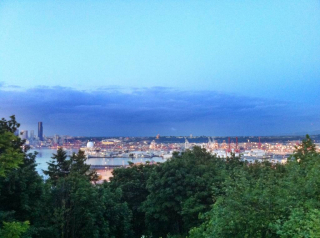 Some of the grandest views of downtown Seattle are from the homes in West Seattle. Here you’ll find a mix of million dollar view condominiums, turn of the century houses and homes in the hills that range from Contemporary to Northwest Classic to Traditional. As of 3/10/2013, the least expensive available property in West Seattle is a 2 bedroom, 1.75 bath condominium for $109,900. The most expensive is a $14,888,000 4 bedroom, 3 bath view home with the original 1927 pool and cabana. Looking at the last 90 days, the Median List Price in West Seattle is $400 with homes selling for a Median Sale to List Price of 99.3%.